I'm excited to announce that one of my landscape photographs is being sold in American Furniture Warehouse locations throughout Colorado! 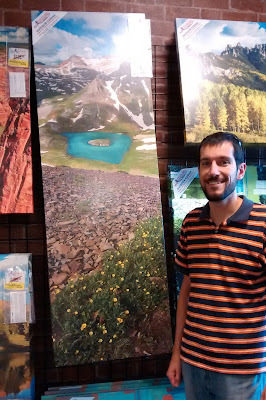 We visited the giant Firestone store this afternoon and found canvas prints of my popular " Island Lake Vertical Panorama" hanging among other landscape prints by talented artists of the western states. The picture, taken near the town of Silverton, features the beautiful Island Lake with Vermillion Peak in the distance and alpine wildflowers in the foreground . The image was submitted and accepted in AFW's Artists of the West program months ago and is now being featured in stores. can you tell me about any sales you had? AFW handled all the printing and sales. They sent me a monthly statement with info on the number sold. If you have any more questions send me a pm!